In South Africa, mining is a major environmental challenge for crop production, leading to high concentrations of toxic elements in soils. Toxic element contamination often results in poor crop quality and reduced nutritional value of crop species. Surprisingly, it has been shown that non-essential elements such as arsenic and cadmium are taken up by native nutrient transporters (i.e. iron and phosphate transporters) located in the plasma membrane of plant roots. To gain insight into the underlying mechanisms of toxic element uptake in plants, Asst. Prof. Dr. Marshall Keyster from the University of the Western Cape, South Africa (UWC) is visiting the University of Missouri to work with two Interdisciplinary Plant Group (IPG) faculty members; Dr. Antje Heese (Department of Biochemistry) and Dr. David Mendoza (Division of Plant Sciences) during September - November 2016. This cross-continental collaboration will investigate whether altering the abundance of specific transporters at the plasma membrane will lead to changes in toxic element accumulation in plants. If successful, this research could help developing crop varieties with enhanced tolerance to non-essential toxic elements, thus increasing food security, quality and sustainability in South Africa. The two universities are no stranger to working together. They have a long-standing academic exchange program dating back to 1986. The collaboration between Drs. 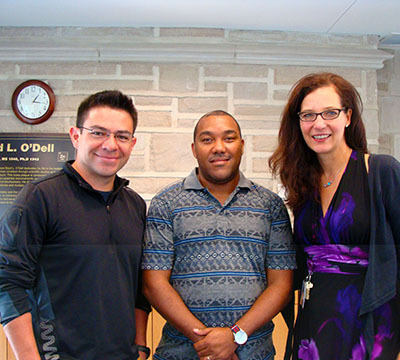 Heese and Mendoza and Dr. Keyster developed from a symposium held at UWC in June 2015, to expand the longstanding UWC/UM program to include an exchange program in plants science between the two universities. A total of twelve participants from MU, including two graduate students and one postdoc, attended the symposium. Dr. Keyster has received funds from the University of Missouri-South African Education Program (UMSAEP) to support his work at MU. Dr. Heese and Dr. Mendoza are faculty members in the College of Agriculture, Food and Natural Resources (CAFNR) and members of the Interdisciplinary Plant Group (IPG) at MU.